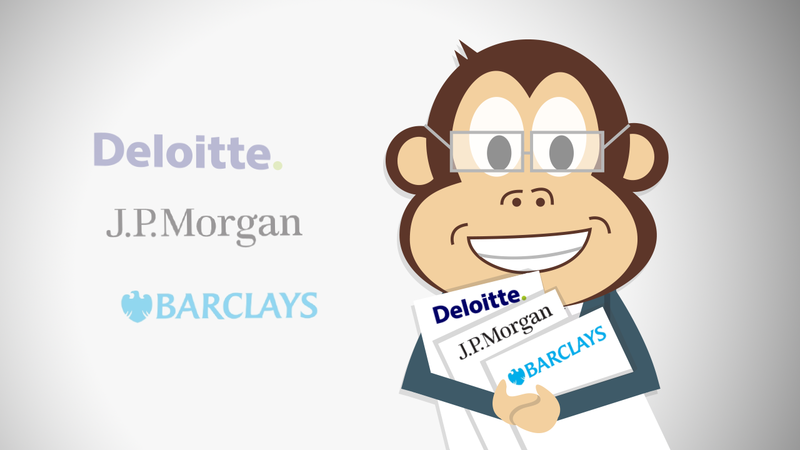 Who Should I Work For: Big Four Or An Investment Bank? Ernst & Young, KPMG, PwC and Deloitte are the most prestigious firms in the professional services sector today. Every year, hundreds of fresh graduates come out with majors in finance or accounting and usually find themselves stuck in a dilemma – to work for one of the big four companies or start a career at an investment bank. If you’re undecided between working for a big four company and an investment bank, read on to know the pros and cons of working for the big four vs. pursuing a career in investment banking. With 170,000 employees, Deloitte is the largest firm in terms of manpower. Specializing in financial advisory, consulting, audit and tax, Deloitte LLP ranks number one in the US and around the world. Deloitte is an ideal career choice for fresh grads for they hire hundreds of entry level employees through different universities. Deloitte strives to reach out to a broader spectrum of individuals who wish to pursue a career in the accounting industry which is why the company is subdivided into 4 subsidiaries that provide countless job opportunities to individuals in categories like financial advisory services, taxes, consulting, growth enterprise, risk advisory, technology and Deloitte Real Estate. For most fresh grads, gaining experience in the field of accounting is more important than the salary offered. However, the pay scale is still taken into consideration when applying for a job. The average salary earned by new graduate at Deloitte falls in the bracket of £31-33k. Here are some stats related to job satisfaction that we’ve picked from an anonymous survey conducted by GreatRated!. 96% employees working at Deloitte feel that the work given to them is both personally challenging and interesting. 92% described the work environment as collegial yet demanding. On the other hand, more than 85% employees agree that that Deloitte offers great rewards both, monetary and nonmonetary. Ample perks are offered by Deloitte including free snacks and beverages, personal travel service, fitness classes, etc. With its main focus on environmental sustainability and corporate social responsibility, PwC services clients from various industries including pharmaceuticals, aerospace, banks, defence, media and biotechnology. According to insiders, PwC is seen as the machine of the Big Four – just like the Terminator. The company is seen as the most posh out of the four and generates the most revenue too. However, employees at PwC don’t get enough free time as they normally would at another big four firm. PwC is one of the best accounting firms to kick start your career in finance. The learning curve at PwC is steep but employees usually have to work under stringent deadlines and pressure. If you like challenging tasks and deal with tough situations, PwC is the place to be to. You’ll also make a lot of industry connections and networks when you start working at PwC. On another note, this big four company truly values diversity and has a strong commitment towards training and development of its employees. However, one of the major disappointments that new graduates face at beginning their career at PwC is that working late nights and weekends is not uncommon. An associate with minimum experience of 0-2 years makes earns an average salary of £ 29,406. The salary increases to an average of £ 41,806 once you gain 2-4 years of experience and become a senior associate at the firm. According to a recent survey conducted by Vault.com, PwC ranks second in terms of job satisfaction after Deloitte. Even though most employees find the work environment at PwC challenging yet stressful most of the times as they usually have to pitch in more work hours and even work on weekends, PwC stresses upon the wellbeing and psychological health of its employees. PwC’s Business Fit programme is especially designed to indentify and treat health conditions like mental health issues, knee and back problems, etc. A lot of perks and work benefits are also offered to employees such as longer vacations, retirement benefits, insurance benefits and bonuses. Ernst & Young is a global leader in providing transaction and advisory, assurance and tax services. EY provides its invaluable services to clients from various industries like technology, telecoms, aviation, energy and retail. Working at Ernst & Young is a pleasant experience for fresh graduates who want to maintain a work-life balance since this firm truly believes in flexibility. Just like PwC, the work environment at Ernst & Young is challenging and provides its employees with great new opportunities to showcase their talents alongside other hugely capable people. The experience one gains at Ernst & Young lasts a lifetime for it provides its employees the chance to work with the biggest and most thriving businesses in the world. The average salary earned by an associate at Ernst & Young is £ 28,696. However, once the associate is promoted to the position of senior consultant, he or she may earn up to £ 49,661. In order to retain employees, Ernst & Young offers amazing perks and work benefits. EY Discounts enable employees to get discounts on everything they buy – from restaurants to computers, cell phones, new and used cars, electronics, movie tickets and personal vacations. A proper flexible benefits system is also in place that offers work benefits to employees pertaining to health and wellness, retirement, family and parenting, vacations, etc. To enhance the work experience of its valuable work staff, Ernst & Young spends millions of pounds of training and development programs for its employees. KPMG is a big four accounting firm with a global presence in more than 140 countries. KPMG provides financial accounting services to clients from the government to public sector agencies and even non profit organizations. To work at KPMG is a dream-come-true for fresh grads and professionals alike. According to Big Four insiders, KPMG works with a ‘work hard, play hard’ mentality; making it one of the best companies to begin a career in financial accounting. KPMG is also regarded as the friendliest firm out of the Big Four given its friendly work culture and laidback work environment. With plenty of great opportunities to bring one’s talent to the forefront when working with fast-paced career progression, the work experience at KPMG is unlike any other. The salary range for an audit associate at KPMG is between £ 27,000 and £ 47,242. The average salary earned is £ 32,403. KPMG believes in rewarding its hard working employees with the best perks and benefits to make them stay. KPMG offers its employees an opportunity to pick and select perks and benefits according to their needs along with standard benefits pertaining to health and wellness, vacation, parenting, financial and retirement, etc. Why Work For An Investment Bank? Working at a top notch investment bank like Morgan Stanley, JPMorgan Chase, Merrill Lynch, BNP Paribas, Goldman Sachs, etc. is another great career opportunity for those who want to excel in the field of investment banking. It is believed that landing a job in an investment bank is relatively more difficult than starting a career at a big four firm. Here we analyze the pros and cons of working at an investment bank in terms of career, salary and job satisfaction. A career in investment banking is financially rewarding and pretty stable. In public accounting, one has the opportunity to choose from a variety of financial and accounting roles and disciplines. As you climb the career ladder, financial careers can result in narrower yet more successful positions with higher than average incomes. When it comes to kick starting a career in the investment banking field as a fresh grad, the only barrier to entry is cutthroat competition from competitors. According to an article published in the International Business Times, salaries for entry level positions at top notch investment banks has now skyrocketed to £ 100,000. This is mainly due to a structural change that has resulted in more fresh graduates working for investment banks as compared to senior staff members. Even though putting in 80-90 hours a week when working in an investment bank is the norm, young investment bankers are fairly satisfied with their jobs. According to a survey conducted by Vault.com, it’s not just the high salary that makes investment bankers stay. It’s the work itself that is highly satisfying. A day in the life of a young investment banker is action packed with challenging work and high pressure situations coupled with great opportunities to showcase their skills. We hope this detailed comparison on Big Four vs. Investment Banks helps you in making a decision on where to begin your career once you graduate. Log on to www.graduatemonkey.com for SHL aptitude test tutorial packs today! This entry was posted in Uncategorized on October 30, 2015 by graduatemonkey.